Earnings – In terms of earnings per share, GLUU did incredibly well. In the first quarter, analysts were expecting for the company to produce a loss of $0.05 per share. However, the company actually reported a loss of $0.03 per share, coming in $0.02 ahead of expectations. Revenue – When it comes to revenue, GLUU definitely didn’t disappoint. In the first quarter, analysts expected that the company would produce revenue in the amount of $48.2 million. However, the company actually reported its revenue at $54 million, blowing away expectations. 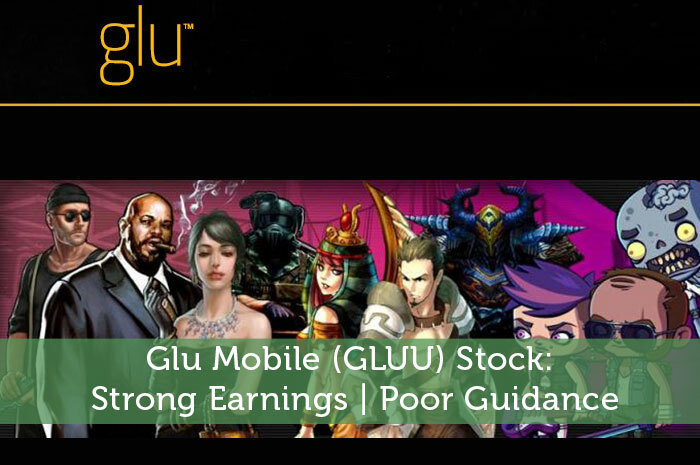 Guidance – While Glu Mobile did incredibly well when it comes to earnings and revenue, there was one area of the report that proved to be a major cause for concern for investors. Unfortunately, the company’s guidance came in well below expectations. For the second quarter, GLUU is expecting to report a loss between $0.05 per share and $0.06 per share. This proves to be a wider loss than analysts are expecting to see. For the full year, GLUU is expecting to report a loss per share in the range between $0.11 and $0.16 on revenue between $215 and $235 million. This came in well below expectations of a loss of $0.09 on revenue of $268.8 million. As investors, we know that the news moves the market. Any time there is positive news surrounding a publicly traded company, we can expect to see gains in the value of the stock associated with the company as a result. Adversely, negative news will lead to declines. In this particular case, the earnings report was overwhelmingly positive. However, the negative guidance outweighed the positive. As a result, we’re seeing big declines in the value of GLUU today. Currently (11:31), GLUU is trading at $2.20 per share after a loss of $0.47 per share or 17.52% so far today. Moving forward, I’m not expecting to see much by way of positivity out of GLUU. The reality is that GLUU had one smash hit video game, and has seen issues with regard to revenue and earnings since. At this point, it seems as though investors are losing faith in the company, and for good reason. All in all, I’m expecting to see further declines. Where do you think GLUU is headed moving forward and why? Let us know your opinion in the comments below!